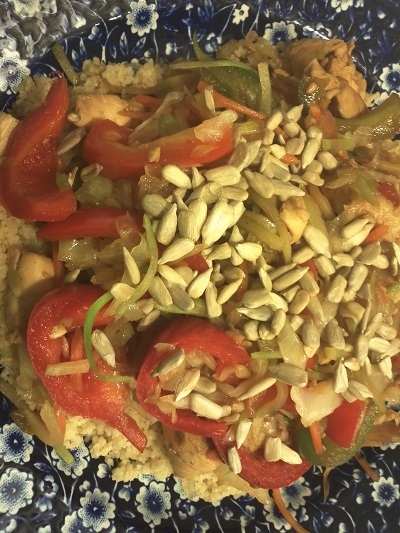 This chicken stir fry is a favorite vegetable filled treat. It is a dinner option that can be made in less than 20 minutes. It's colorful and is a great option when you need to clean out your refrigerator of extra vegetables that need to be used. 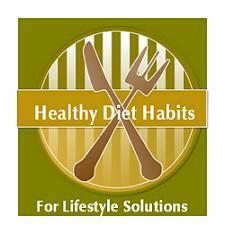 I use broccoli slaw and cabbage that are pre-chopped to reduce preparation time. Fred Meyer and Trader Joe's offer chopped vegetables cheaply. 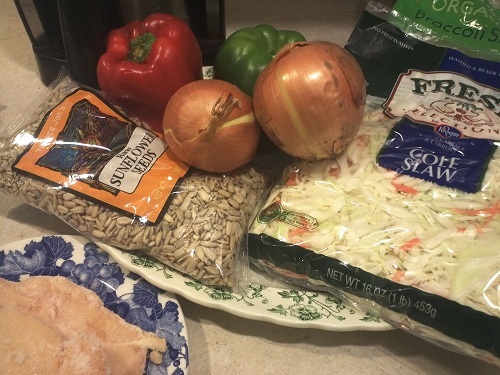 The only preparation will be to chop the chicken, peppers, and onions. Use this recipe as the base recipe and add extra seasonal vegetables to the mix for added health benefits. Adding a variety of different seasonal stir fries to your meal plans is a healthy diet habit you should adopt for great weight control! Stir fry the chicken and garlic until nicely browned in a small amount of oil. When the pan gets dry, add 1/4 cup or more water to the pan and stir fry. Be careful because it will steam. 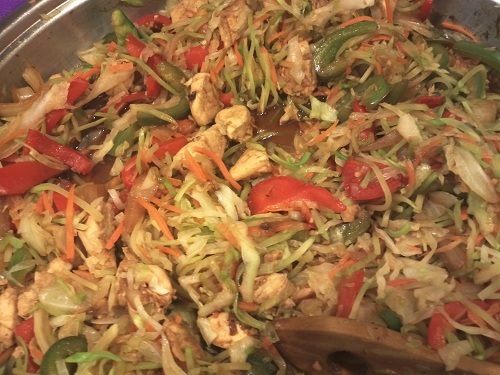 Water stir frying saves calories. Remove the chicken to a bowl. Stir fry the onions until they are browned and then add the peppers and stir fry until they are still crispy, adding more water to avoid sticking. Remove the pepper mix to the chicken bowl. Add the broccoli slaw and cabbage and more water and stir fry them till they are crisp tender. This will be quick. Keep adding water so the pan does not go dry. When the cabbage mix is done add the chicken, pepper mix back in and heat through and add the Yoshida's sauce and heat through. You can add more sauce if you like more. Serves 4, if you serve it over a grain, otherwise 3 huge servings! Serve this stir fry by itself or over your choice of grains. 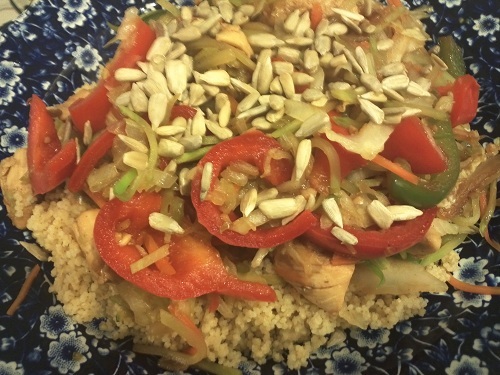 I often serve it with whole wheat couscous or brown rice. The problem with rice is that it takes longer to cook than the stir fry. I routinely cook a large pot of brown rice, divide it into family size portions, and freeze it for later use. This recipe is a bare bones recipe that I usually add other seasonal vegetables to. Some of my favorite additions are zucchini, asparagus, green beans, cauliflower, broccoli, and peas. I shop sales and buy seasonal vegetables, so the meal rarely looks the same!